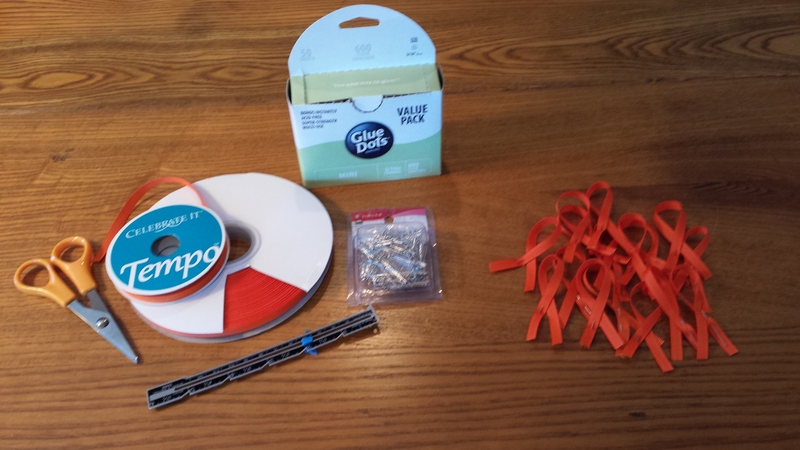 We created our first batch of orange ribbons to hand out at Boston’s “Jobs Not Jails” rally on April 26, 2014. Here’s a photo of 1,200 ribbons. 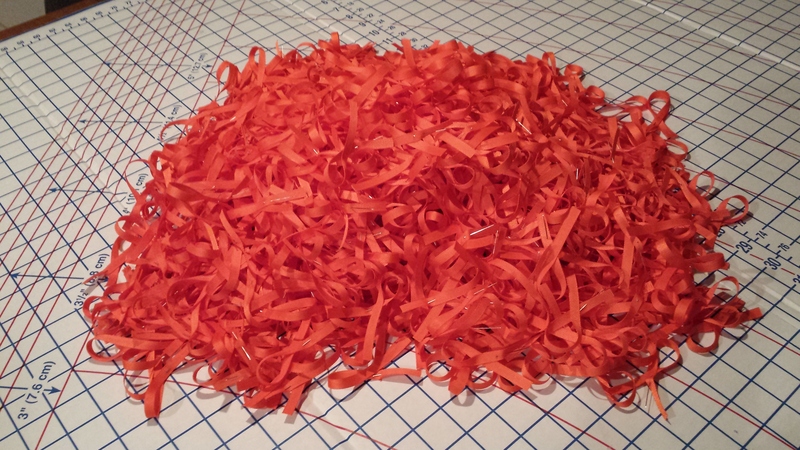 This is a huge pile of 1200 orange ribbons for a Jobs Not Jails rally in Boston. The are a new symbol of ending US mass incarceration. Orange ribbons are a wearable symbol of the 2.3 million people incarcerated in the USA, which is the world-wide leader in incarceration. Wearing an orange ribbon shines the light on the shameful secret of U.S. mass incarceration and reminds us to act to end it. You can make orange ribbons easily by following the steps below. They cost 6 to 10 cents each, depending on where you buy the supplies. Our commitment is to wear the ribbons in the months and years ahead, as we each play our own role in the movement to end mass incarceration. As we stand in line at the post office or grocery store, or go about our daily activities, we hope that others will ask about our orange ribbons. At the end of this page, we’ve listed some basic facts to start the conversation. Glue dots make the assembly fast, clean and easy. All of the supplies are easily available at craft stores. 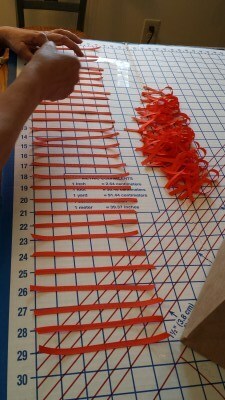 Orange grosgrain ribbon – We used 1/4 inch wide ribbon. Some prefer 3/8 wide ribbon. One yard makes six 6” ribbons. We used 50 yard rolls from Gifts International. Smaller rolls are available at many craft and sewing stores. Grosgrain ribbon is preferable because satin ribbon isn’t sturdy enough. We’re going to wear these ribbons for as long as it takes to end the injustice. Glue Dots Mini (3/16 inch) – Glue dots eliminate drying time. We bought our value packs (600 dots in a box) from Paper Mart. We liked this brand because the sheets are perforated, making them easier to use. Smaller quantities are available at many craft stores. Make sure they are “permanent.” Some are sold in dispensers, but you don’t need a dispenser. Fingers work just fine. 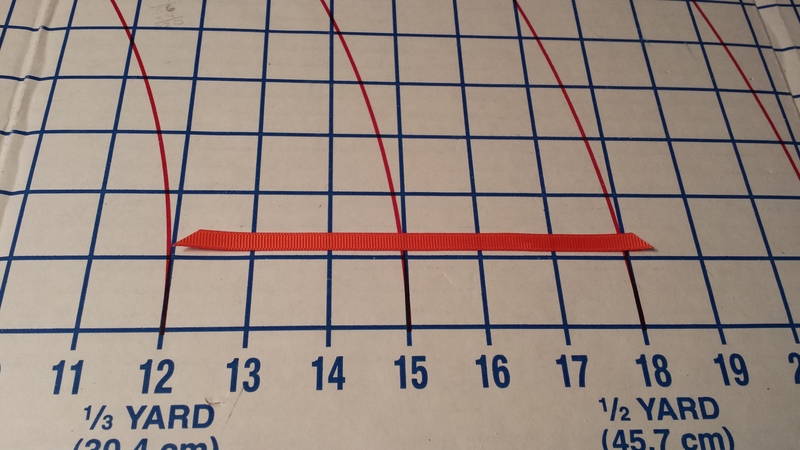 Straight pins – find straight pins (often sold in packs of 500) at drug stores and craft stores. Some prefer 1.25 inch pins instead of traditional 1 inch pins. Step 1 Cut the ribbon into 6” lengths (if you are using 1/4 inch wide ribbon). It looks nice if you cut the ends at an angle. It takes 6 inches to make a small ribbon, more than I expected. That’s 6 ribbons to the yard. Step 2 Tear off a strip of glue dots. Carefully peel off the opaque paper, leaving the glue dots on the clear side. 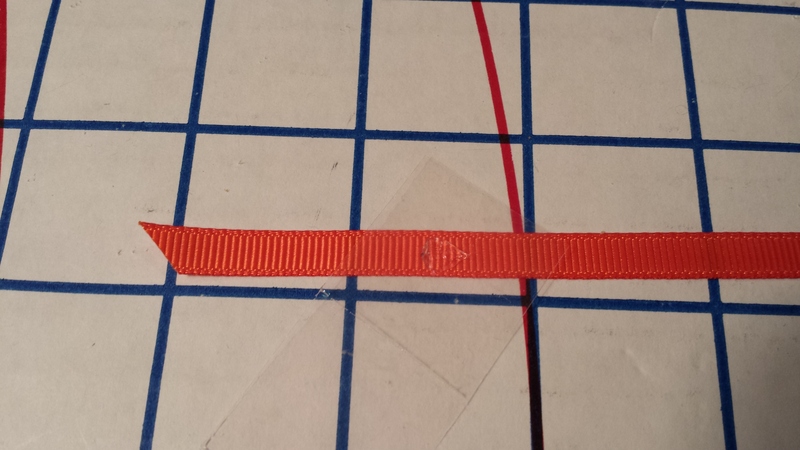 Turn over the strip and press on a glue dot 1½” from one end of the ribbon. It’s hard to see the glue dot on the orange ribbon, but it’s there and super-sticky. 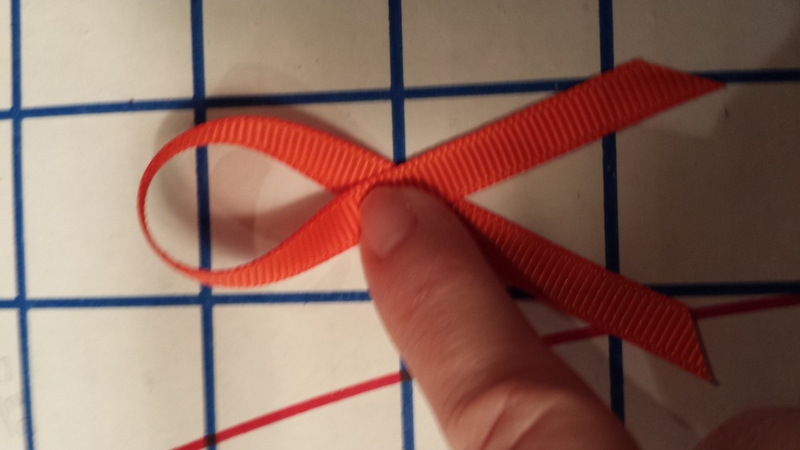 They simplify the ribbon making. Working together, eating, talking and laughing, we devised an assembly line – very impressive. An assembly line can speed it up if you’re working at a table. I made about 500 in my lap while riding in a car. Step 3 Pick up the other end of the ribbon and fold it over so the ends are the same length. Aim for a 45 degree angle (half a right angle). Press the two sides together at the glue dot. Push down on the glue dot for a permanent bond. Not even the pin can prick through it. 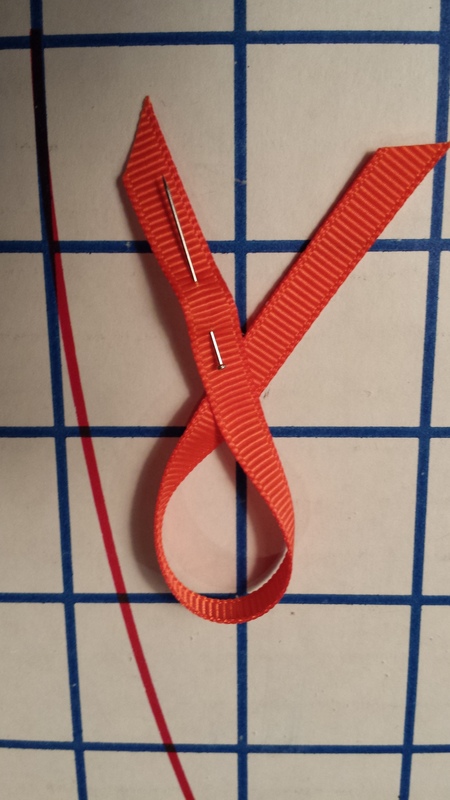 Step 4 Add a straight pin so people can pin the ribbon to their clothes. Put a straight pin and voila! You have a powerful symbol to wear daily that the USA must end mass incarceration. Here are some easy ways to talk about mass incarceration, without sounding like you are giving a lecture. Appreciate that someone is curious about the ribbon. Give room to be unfamiliar with information about mass incarceration and mandatory minimum sentencing. Acknowledge different viewpoints. Be ready to offer ways they can learn more and get involved, all in a one-to-two-minute conversation.